1Click the Layer Properties button in the Layers panel on the Home tab of the Ribbon, or type LA at the command line and then press Enter. The Layer Properties Manager palette appears. A new drawing has only one layer: Layer 0 (zero). You need to add the layers necessary for the drawing. The Layer Properties Manager palette, as well as individual columns within it, can be stretched wider so as to not truncate information. The easy way is to right-click a column header and then choose Maximize All Columns. 2Click the New Layer button (it looks like a sheet of paper with a little sunburst on one corner) to create a new layer. A new layer appears. AutoCAD names it Layer1 but highlights the name in an edit box so that you can type a new name to replace it easily. 3Type a name for the new layer. Layer names should be descriptive and organized so that they’re easily identifiable and can be sorted logically. 4On the same line as the new layer, click the color block or color name (by default, the same as the current layer) of the new layer. The Select Color dialog box appears, with Magenta selected from the Color Index list. 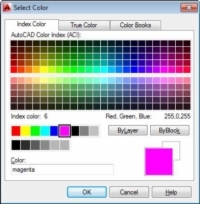 The normal AutoCAD color scheme, known as the AutoCAD Color Index (ACI), provides 255 colors. That number of choices is overkill for ordinary drafting, but if you truly want to go overboard, the True Color tab provides more than 16 million colors, whereas the Color Books tab gives access to many standard color books (such as Pantone books) that are used by the printing industry. 5Click a color to select it as the color of this layer and then click OK. The Select Color dialog box closes. In the Layer Properties Manager palette, the Color column now has the new layer color — either the name or the number of the color you selected. 6On the same line as the new layer, click the Linetype name of the new layer to draw a dashed (hidden) line. The Select Linetype dialog box appears. The default AutoCAD linetype is Continuous — the line has no gaps. 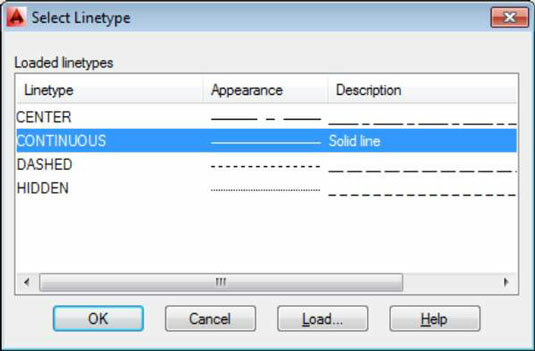 If you already loaded the linetypes you need for the drawing, or if the initial template file has linetypes loaded, the Select Linetype dialog box displays them in the Loaded Linetypes list. If not, click the Load button to open the Load or Reload Linetypes dialog box. Unless you have a truly good reason, avoid loading or using any linetypes labeled ACAD_ISO. These linetypes are normally used only in metric drawings — and rarely even then. 7Click a linetype in the Loaded Linetypes list to select it as the linetype for the layer; then click OK. The Select Linetype dialog box disappears, returning you to the Layer Properties Manager palette. In the Name list, the linetype for the selected layer changes to the linetype you just chose. 8On the same line as the new layer, click the new layer’s lineweight. The Lineweight dialog box appears. 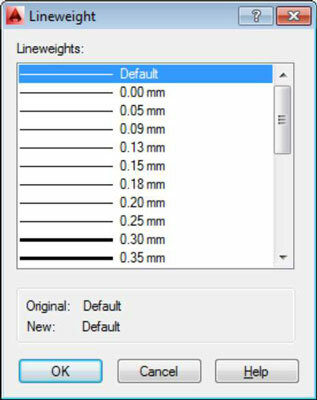 9Select the lineweight you want from the list and click OK. Using the lineweight property is a two-step process. After you assign a lineweight to a layer, you must click the Show/Hide Lineweight (LWT) button on the status bar to see the effect. You can turn the feature off and on with this button. A lineweight of 0.00mm tells AutoCAD to use the thinnest possible lineweight on the screen and on the plot. Leave the lineweight set to Default, and instead later map screen colors to plotted lineweights. 10Set any options you want for this layer. In the same line as the new layer, click the value in the Transparency column. Set the plot style for the new layer. Turn plotting on and off. To add a description to the layer, scroll the layer list to the right to see the Description column, click in the Description box corresponding to the new layer, and type a description. Repeat Steps 1–13 to create any other layers you want. 11Select the new layer that you want to make current, and click the Set Current button (the green check mark). Changes you make in the Layer Properties Manager palette are instantaneous. Therefore, if objects in the drawing are already on a particular layer and you change the color for that layer, the existing drawing objects change color immediately and don’t wait for you to close the palette. The Layer drop-down list now displays the new layer as the current layer — the one on which AutoCAD places new objects you draw.